Hypertension, or high blood pressure, is the number one risk factor for stroke and a major risk factor for heart disease. Nearly half of adults in Canada over the age of 65 have hypertension. In addition, about a quarter of adults in Canada over the age of 60 are pre-hypertensive, meaning they do not yet have hypertension but are likely to develop it if they don’t make changes to their lifestyle. Preventing hypertension by adopting healthy habits can help Canadians live longer and healthier lives as well as ease the financial burden that an aging population with chronic illnesses can place on the healthcare system. But many Canadians struggle to make the necessary lifestyle changes. The Heart and Stroke Foundation, Canada’s leading funder of life-saving research and cardiovascular health-related advocacy, was planning an innovative national hypertension prevention program targeting adults 60 and older, funded through a social impact bond—a first in the Canadian healthcare space. Its promise to investors was that they would receive gains if the program met its targets—enrolling 7,000 pre-hypertensive adults in Toronto and Vancouver and halting the increase in their blood pressure. Recognizing the strategic importance of a successful launch, Heart and Stroke approached Bridgeable to design a service, including physical and digital touchpoints, that could make it easy for people to sign up and manage their diet and exercise, potentially preventing heart disease and stroke. 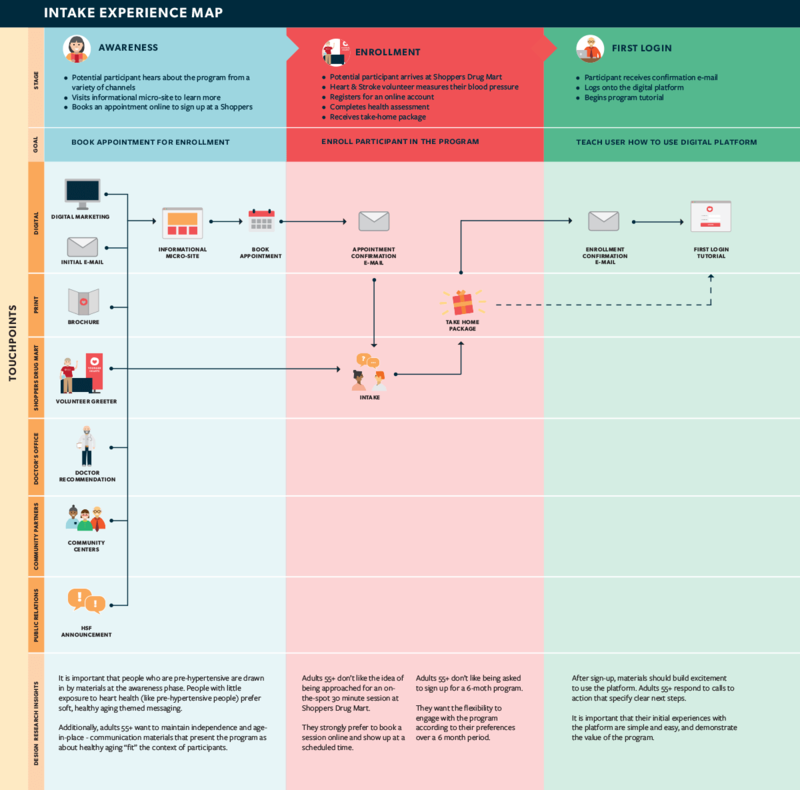 Our challenge was to help Heart and Stroke meet enrollment targets of 7,000 users by designing the intake experience, improving the usability and appeal of the existing program design, and developing supporting high-fidelity prototypes to guide launch and implementation. Public health initiatives often focus on warning people of risks and providing detailed information, but this approach often fails. Adults generally know that they should exercise, eat well, and not smoke, but changing entrenched habits can be difficult. Designing a new service to engage adults 60+ required a wholly different approach. Clinicians value cold, hard data—and our solution could have reflected that sensibility by providing detailed information above all else. Our users, however, told us that they needed simplicity. In an optional program, simplicity is crucial to convince people to take time out of their daily life to participate. Adults 60+ have clinical health messages thrown at them every day. Often these messages are unhappy and threatening: do what we tell you, or else. Working with our user group convinced us to build solutions that would not try to scare them—in fact, we wanted to make our material appear light and enjoyable, reflecting the kind of lifestyle improvements the users would get out of using them. Health regimens can sometimes feel very isolating, and success rates are higher with community involvement. On top of that, our user group demonstrated a desire to connect with a community for motivation and cameraderie. When we talked to our user group, messages about statistical risk and heart conditions didn’t always resonate. But when we framed heart health in a larger conversation of healthy aging and living longer, people were more interested in being engaged. There are two advantages to using digital technology when implementing a public health service: data collection and cost. Getting older adults to adopt digital tracking provides data that can be used to manage care across the population. And the cost burden of a website that connects people with community exercise groups is much lower than the cost of a healthcare worker coaching an individual. As the team approached the challenge of figuring out how to get aging populations to use digital technology more, they realized that the research participants were already using digital devices. Unlike previous generations, baby boomers are increasingly computer literate, using iPads and Fitbits to track steps and FaceTime with family members. Our users were excited to use simple, fun, and friendly digital interfaces. Integrating digital solutions into our users’ lifestyles was key for them. Being able to download recipes or use fitness trackers to keep track of steps made sense for the kinds of small, incremental changes that are necessary to see progress. We built digital touchpoints like an informational microsite, online tutorials, and interfaces for community activity that sparked users’ interest in trying new things. In validation sessions, users responded positively to the personalizations the prototypes offered. “If it is addressed to me, I know they are thinking about me … and I want to respond,” one user noted. The intake process for Heart and Stroke’s initiative was the primary focus of Bridgeable’s project. We needed to ascertain the optimal level of engagement in an in-person context. 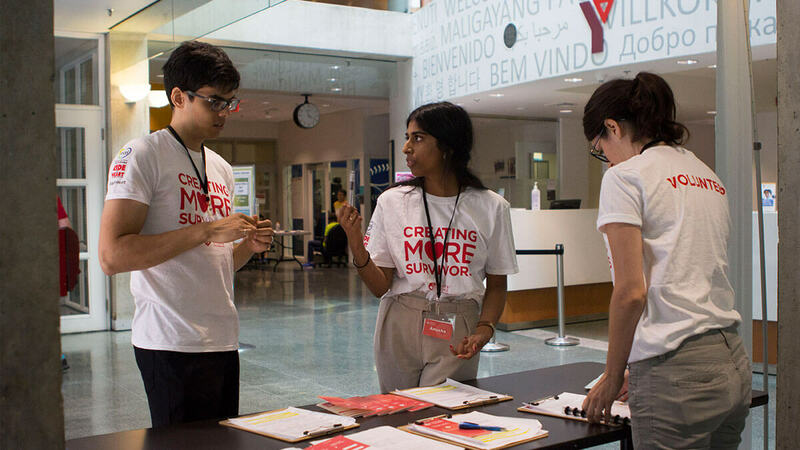 When we prototyped a recruitment process in a community centre, the team found that members of the community initially assumed we were soliciting donations for Heart and Stroke, leading us to a key insight: most of volunteers’ work toward enabling behaviour change should take place at a follow-up, where participants have chosen to seek the program out. We figured out that volunteers are not just pitch people for better health. The role of the Heart and Stroke volunteer should be to lead their small community toward better health, to be able to answer questions throughout the program, and to keep in touch with program participants. When we retire, it becomes more difficult to feel connected to a community. For most people, a strong community to work with and be accountable to is a key driver of physical wellness. Our users wanted to make sure we understood that they were still busy. We noticed that becoming involved in a local community is one way that people maintain an active lifestyle, and this insight around community involvement drove a new perspective on how a health program could fit people’s lives. Younger Hearts focuses on three stages: awareness, enrollment, and first login. At the awareness stage, we are looking for a self-selecting population of enrollees. We do this by reaching people through emails, brochures, conversations with volunteers, and clinical recommendations. By engaging with the signup page on the website, users can book an appointment or find times for a drop-in session at a local site. At the enrollment stage, we offer users a basic health assessment, including blood pressure check, and a take-home package with information designed to help them manage their day-to-day health. We fully prototyped and tested a self-directed, user-friendly health assessment as well as a step-by-step guide for volunteers. We also built a take-home package that volunteers can give to new enrollees. It includes fridge magnets, next-step cards, and shoelace tags. These act as informational reminders that resonate with our fun and friendly ethos. For users’ first login, we designed a tutorial that smoothly onboards users to the Younger Hearts web interface, which connects users to a community of like-minded people and community resources. Heart and Stroke’s goal is to create a large-scale change in the public health landscape in Canada, and we played a critical role in helping them achieve their vision. The Younger Hearts prototype was incorporated into the vision for a larger hypertension prevention program funded by a consortium of private investors and backed by the Ontario government. Younger Hearts brought more than just a feature-rich and research-driven platform for Heart and Stroke to use as a foundation for their nationwide project. Our four design principles became clear, user-centred guidelines for the Heart and Stroke team to use in their future efforts. 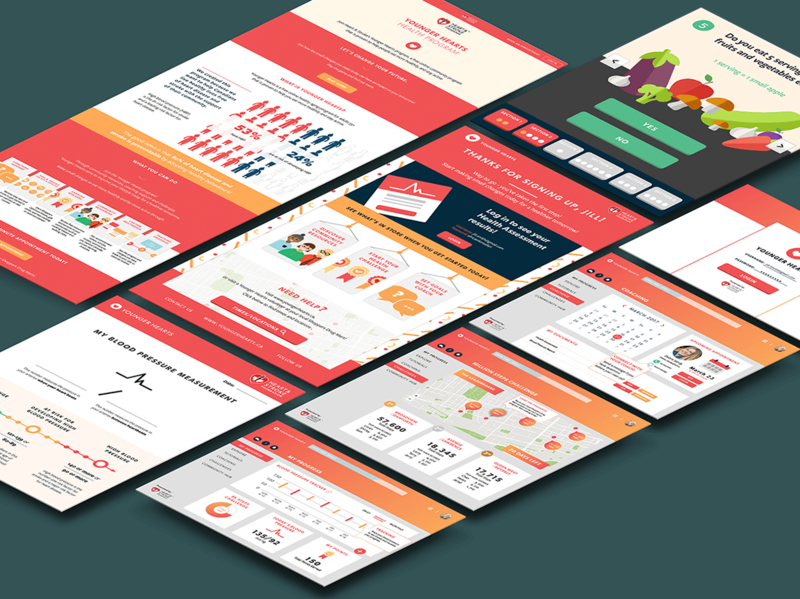 Heart and Stroke also requested a large-format print of the four design principles so that the user insights we gathered could be embedded within their organizational culture. The Community Hypertension Prevention Initiative was launched in fall 2016 with a target enrollment of 7,000 adults aged 60+ with normal-high blood pressure. Over 90 percent of an initial cohort of 500 enrolled in May 2017 participated in the entire six-month program. Blood pressure readings in a sample of 100 of these first 500 enrollees showed exciting results for a lifestyle intervention: an average blood pressure drop of 5.2 points that returned many participants from the “normal-high” to “normal” category. A second group of 4,100 participants is scheduled to be signed up in the Greater Toronto Area in early 2018, a further 2,400 participants will be recruited in Vancouver in 2020. The launch is bringing the Younger Hearts prototypes into full view. Rather than using the hard-sell tactics of detailed information and scary statistics, Heart and Stroke is able to engage older Canadians in a program that listens to them and meets their needs. The program is helping Canadians aged 60+ understand that their heart health is related to their overall wellness as they age and is leading to positive measurable health results. To read more about the project and explore the prototypes, visit Younger Hearts. Read the Implementation Guide here. Read the Prototype Catalogue here.